Probably most of your Christmas candy is just a memory on your lips (and maybe still on your hips!) but with Valentine’s Day just around the corner, it is time to order more. Wouldn’t Ruth’s Toffee be just the thing you need for that someone special in your life, or just to treat yourself? 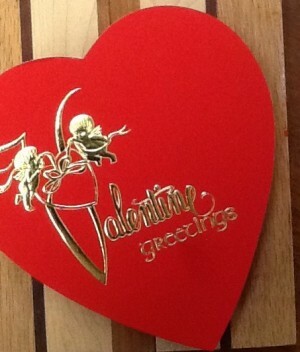 It still is not too late to order and get something from Ruth’s Toffee in time for Valentine’s Day. We usually ship by USPS and although we make it a practice to never guarantee the performance of the postal service, our experience has shown that their Priority Mail service can get our candy from here in the mountains of Western Colorado to the farthest corners of the continental US within 3-4 days. Delivery is even faster if you don’t live in the farthest corners. As a special, I want to offer a 10% discount on any candy ordered between now and Valentine’s Day. Just order anything on the web and then use “Ten” as a discount code when you check out. Your discount will be automatically taken off your order. We also still have the free shipping offer for any order more than $70 shi pped to one address, so if your order reaches this amount, you will also get free shipping. My final Valentine’s offer is toffee in a beautiful bright red Valentine’s Greetings box, as shown here. You get 10 oz. of toffee (your choice of milk or dark covered chocolate), the cheerful and colorful Valentine’s Greetings box, and Priority Mail shipping to anywhere in the US for a total price of $20. This offer is not available on the website so if you want to take advantage of this, send me an email (ruth@ruthstoffee.com) or call (800-699-6199) with names and addresses of who all you want to treat with this colorful box of toffee. There is no limit on how many you can order — just be sure to send me your contact information so I can call you if I have questions and for payment information. Have a sweet Valentine’s Day and remember — Don’t be Ruthless on this special day! Sign up here and be notified about new products, sales and events! Just wanted to say thanks for the toffee! We received some from another client but it wasn’t anywhere close to what you guys give me 🙂 Absolutely love Ruth’s…in fact I don’t share it with anyone! My sister-in-law sent us truffles and toffee for Christmas! They were the best I have ever had and I have been all over the world. Thank you! Will keep you in mind for gifts in the future. Best toffee we ever had – I’m hooked! Thank you! I just got home from Aspen and had purchased your toffee at the Farmer’s Market. I am a toffee-aholic! My husband sort of likes it. I buy it wherever I am. He hardly ever eats it. We fought over the last pieces! Yours is the best! I am placing an order immediately! THANKS! I have not eaten a sample of every type of toffee, obviously, but I simply cannot imagine another brand which would outmatch yours. Thank you; if you ever need a spokesman for your product I’ll be happy to do the job. You, your company & products are wonderful! Many thanks for this expedited handling of our orders. Happy holidays to you and many thanks. I received a box of your toffee for Christmas and just wanted to let you know how much I loved it! Wonderful toffee!!!!!! I have bookmarked your website for future gift giving. 🙂 Thank you again, and Happy New Year to you and your company! OK,I admit it. I licked the crumbs off the plate — and I bet I’m not the only one to have ever done that. Toffee is great. We had the almond toffee. Best regards for a happy holiday season to everyone at Ruth’s Toffee. Hands down, this is the best toffee I’ve ever had. It is buttery soft, fresh and arrived well packed to avoid breakage. Absolutely wonderful, and I will purchase again. I recently purchased a pound of your dark chocolate Almond Toffee. It’s the most delicious I have ever eaten! It’s substantial, decadent and totally satisfying! I will be purchasing this and other products you make. Thanks for making such wonderful sweets!